In the culinary arts, the word "amandine" (pronounced "ah-mahn-DEEN") refers to a dish that is prepared with sliced, slivered or whole toasted almonds. Although the word originated in France in the mid-nineteenth century, the technique is used in cuisines throughout the world. Cookbooks in the United States have Americanized the term to almondine, but it refers to the same thing. Among the foods that go particularly well with an amandine garnish are white fish such as trout and cod and vegetables like green beans and asparagus. Chicken also can be prepared with amandine sauce, although not usually other meats. The basic procedure for preparing an amandine sauce is to melt whole butter in a small saucepan or sauté pan and heat until frothy, then add either sliced or slivered almonds. Cook over low heat until the almonds are golden brown, and the butter has also slightly browned, but not burned. Then season with Kosher salt and a squeeze of lemon juice. If your almonds are already salted, cut down on the salt. Note that this recipe calls for whole butter rather than clarified butter because some browning of the milk solids in the butter is desirable. Amandine sauce can be made with whole almonds, but you must blanch the shelled almonds first to remove the brown outer skin. To save time and effort, use packaged sliced or slivered almonds. If you're a freshwater fish aficionado, think of using white fish or trout. Both types are slightly sweet but solid enough to blend well with the almond taste. Saltwater fish choices can include sea trout, grouper, salmon or cod, among others. 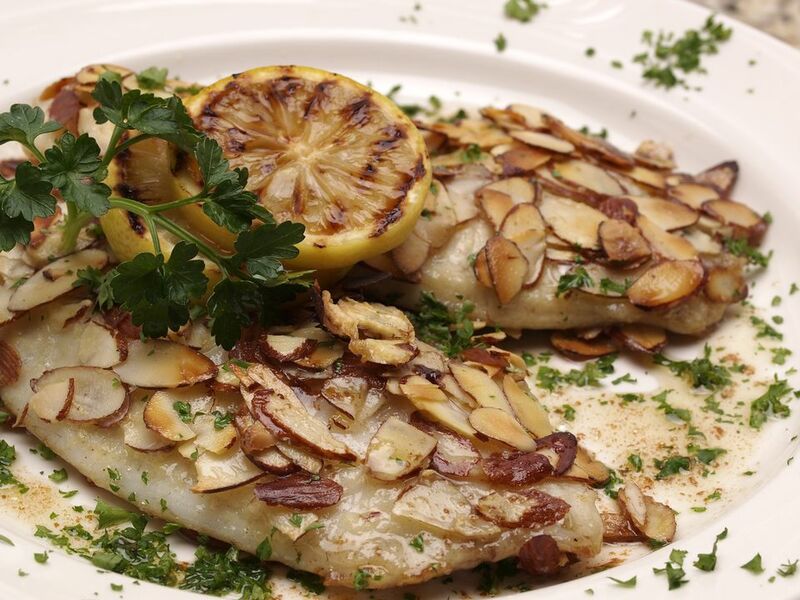 Tilapia is an inexpensive fish that works well with an amandine garnish, too. You can use fresh or frozen fish but bake or fry it before adding the topping. Cooked greens and other vegetables get extra oomph when you prepare them amandine style. Almost any vegetable, but especially green beans, asparagus, broccoli, celery, and cauliflower, work well with the almond sauce or topping. Mix your vegetables in the amandine sauce rather than pouring the sauce over the veggies. While most almond desserts are straightforward, either by name or by way of their ingredients (such as almond cake or biscotti) one might cause confusion: Amandine is the name of a classic Romanian chocolate sponge cake usually filled with chocolate, rum, caramel, and cream—sometimes almond cream. Amandine is also a type of liqueur, flavored with almonds and vanilla. It's typically served cold as an after dinner or after lunch digestif.